Nka Foundation Announces the winners of the 3rd Earth Architecture Competition, Designing for the Arts in Ghana. 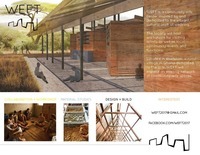 The 1st prize winning design is Abode+Adobe by the design team of Sheikh Ahsan Ullah Mojumder, Chowdhury Mohammad Junayed and Erum Ahmed of the Sheikh Ahsan Ullah Mojumder & Associates in Bangladesh; the 2nd prize winner is eARThouse by Lorenzo Conti in Italy; and the 3rd prize is awarded to Weft Wall by the design team of Eddie Winn and Samantha McPadden in the USA. Four honorable mentions are awarded, each will receive a certificate of recognition. The honorable mentions go to the Sculptors Domain by the design team of Shahid Sayeed Khan, Dania Faruq and Mohammed Ansir in Pakistan; Bamang Earth House by Sanne Eekel in The Netherlands; Art house by the design team of Santiago Merello, Antonella Sinacore and Claudia Varin in Uruguay; and Asase House by the ASA Studio in Rwanda. You can download large files on the winning designs here: yadi.sk/d/5yVCbZAUhdKbu and see all submitted competition entries: nkaprojects.boards.net/thread/41/submitted-design-entries . Through the 3rd Earth Architecture Competition, Nka Foundation issued a challenge to recent graduates and students of architecture, design, engineering and others from around the world to use their creativity to come up with innovative designs for modest, affordable housing for the arts that can be built with earth and other local materials in Ghana. The challenge was to design a mud house type of about 2400 sq feet that sleeps 8 to 10 persons to be built on a plot size of 80 x 100 feet. The construction site is Abetenim Arts Village, near Kumasi in the Ashanti Region of Ghana. The building was to be designed for use by either musicians, theatre artists, potters, sculptors, painters, textile artists, designers, writers, or media arts practitioners. Total costs of constructing the design entry was not to exceed $7,000 (USD) for materials and labor; land value was excluded from this price point. Because the construction of best design entires is a priority, each design team gets an opportunity to build their design entry at the arts village in Ghana. The selection Jury consists of architecture professors, administrators with relevant experience and architects who have led building workshops at the Abetenim Arts Village. The jurors are Christina ANTONELLI, Construction Project Manager at Construction for Change in India; Gilberto Duarte CARLOS, Professor and a Researcher at ESG|Escola Superior at Gallaecia in Portugal; Paolo CASCONE, Associate Professor of Building Technology at the Milan Polytechnic in Italy; Jean GU, M.Arch Candidate at Columbia University in New York in the USA; Bruno MARQUES, professor at the Faculty of Architecture and Arts at Oporto Lusíada University in Portugal; Louis MAYES, architecture student at the London Metropolitan University in the UK; Tai SCHOMAKER, DoYouSpace Architecture at Berlin in Germany; Christopher TOMASETTI, student at Masters degree in Architecture and Masters in Real Estate Development at Columbia University in New York in the USA; and Anna WEBSTER, Part 2 Professional Diploma in Architecture at London Metropolitan University in the UK. The jurors used judging criteria involving functionality, aesthetics and technical matter to select three prize-winning designs. Prizes for first, second and third place consist of a commemorative certificate and a choice of cash reward or construction of winning design in Ghana. As the construction of the best design entries is our priority, between May 2016 to December 2017, we are collaborating with some of the design teams in the competition to run construction workshops to build their design entries based on site in Ghana. Through an open call for participation, each workshop will bring together enthusiastic volunteers from around the world including students and recent graduates of architecture, landscape architecture, engineering, interior design, the arts and anyone interested in construction to join the workshop and play a part in line with their expertise. By immersing the design team in the full circle of designing and building their design, the team members will not only garner project management skills, we anticipate that at the completion of the design-build process, the emerging architects will learn to design what is buildable to make a well-rounded graduate. For the professional, you will find the hands-on earth building experience a pause from your office work to rediscover the rudiments of architecture and nuances that can refresh your practice. Do you have a passion for sustainable architecture? Prove it! Join one of the building workshops to building a design entry in the 3rd Earth Architecture Competition! The building workshop to construct the 1st prize winning design entry, Abode+Adobe will be from August 1 - October 28, 2016. The building workshop to realize the 2nd prize winning entry, eARThouse will be held from July 13 – October 14, 2016; and workshop to realize the 3rd prize winning entry, Weft Wall will be from June 3 - August 31, 2017. Whereas, workshop to realize the design entry, Asase House will run from June 3 - August 31, 2016. The workshop for the Sculptors Domain will be February 2 - April 30, 2017; and that for Art House will be from February 24 to May 25, 2017. Call for participation in these building workshops will be posted at nkaprojects.boards.net . And so, we are inviting schools of architecture and design, architecture associations, volunteer-sending organizations, Without Borders organizations, and community-spirited individuals to join us as project partners and supporters in building the best design entries in rural Ghana. Each building workshop will run for about 12 weeks. Volunteers can join at any time and participate for a minimum of two weeks. Students can use the workshop opportunity to fulfill their college requirements for internship, thesis, or to volunteer just for learning-by-doing on the prototyping project. Interested? Then, contact us at info@nkafoundation.org / www.nkafoundation.org . Below is a list of all designs submitted for the 3rd Earth Architecture Competition, Designing for the Arts. And the building workshops to realize design entries in this competition are listed at the bottom of this page. This Bamang Earth House is a house which will give (a temporarily) home to a ‘collection’ of international artists in the Ashanti region of Ghana. The house will create an atmosphere in which the artists can have a place for their own, but will be stimulated to interact with each other through arts and sharing their home. As this house will be built in the Ashanti region, the cultural values of a rich ancient architecture are woven into the new design. The Adinkra symbols are an important part of the traditional architecture. The design of the Bamang Earth House is found upon three of them. Boa me na me mmoa wo is the symbol of cooperation and interdependence. The design will create a place where artists come together and will be stimulated to learn from each other, work together and discover new possibilities. Bi nka bi stands for peace and harmony. The house will offer a place where people can live in harmony with themselves and each other. This will start with the comfort of healthy living. Followed by a balance of private and public spaces. Ese ne tekrema is the symbol for friendship. It will embody the result of a stay in the Bamang Earth House, where people with various backgrounds will come together to improve life. The house is a composition of six units. On their own, they are an example for a small house for two people, but together they can be the home for a group of related people. Each unit exists of a bedroom for two and an open veranda. The verandas of the units reflect on the courtyards of the Ashanti houses. Together they form an inner courtyard, where arts can be practised. The open character of the semi-private verandas will easily stimulate the communication between the artists. 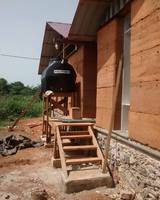 Just as in the ancient Ashanti villages, the house can be easily extended with new units to meet future plans. Two of the units are designed differently and will be used as a living room, kitchen and a sanitary unit. The rooms are all made of hand pressed earth stones. The thick earth walls of the bedroom will contribute to a comfortable interior through the effects of thermal mass. The verandas will be partly enclosed with open brick walls of different heights. The open brick structure will influence the natural airflow through the house positively, but will also refine the brick structure with various patterns. These brick patterns will decorate the house just as the Adinkra symbols has always done in the Ashanti region. Above the rooms and verandas will be a large multiple pitched roof made of corrugated steel. It will enable the artists to work in the shadow and creates a possibility for a system to re-use the rainwater. The shifting of the pitched roofs contributes to the natural ventilation of the house. Hot air can ascend and escape between the different slopes of the roof. Windows and openings in the highest eaves will stimulate the airflow within the bedrooms to create a comfortable atmosphere. The openings will be closed off securely with wire mesh to protect the sleeping artists from mosquitoes. The Bamang Earth House will be a place where people can develop themselves and live in a healthy home. EARTH SKIN HOUSE is an artist residence, art studio and art gallery all in one. The plan is aimed at simplicity, so that activity may ebb and flow naturally, encouraging dialogue and interaction within its communal spaces while providing private sanctuary within the heart of the home. The interior rooms are shielded and contained by the exterior earth walls and adjacent 10 foot wide corridor, thus allowing the private quarters to remain at comfortable temperatures. Foot traffic follows a circular and cyclical pathway. This motion allows for an easy flow through the corridors, which act doubly as studio and gallery space for its residents. Air flows through the block screens at the end of each corridor by means of cross ventilation. The truss webs are covered by mosquito netting and allow for natural convection to further cool the interior. Clerestory windows let light shine into the interior portions of the dwelling, while the parametric screen walls allow light into the hallways, creating a magical display of dappled light moving through the corridors throughout the day. EARTH SKIN HOUSE combines varying modes of construction, all aimed at efficiency in various arenas: construction ease and schedule, human activity and programming, and resulting energy consumption. Working on a grid allows for the use of modular form-work for the construction of the rammed earth walls. The floor plan is arranged along a 6 foot grid and the earth walls are terminated at either end by a block screen or screened doorway, thereby eliminating the need for the construction of any corner form-works. 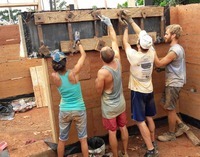 Therefore, the entirety of the rammed earth walls can be constructed using one 6’x6’x2’ form. Old meets new with the incorporation of parametric block screens inspired by new digital construction technologies and constructed of 6” solid Sandcrete blocks and mortared joints. The block walls act as a functional screen, allowing natural light and airflow to penetrate into the corridors and communal spaces while also being a sculptural work of art in and of themselves. Designed utilizing parametric software, the placement of each block is laid out course by course in accordance with the digital model. One of the most distinctive features of Ashanti architecture is the corner solution that appears when two rectangular units come together perpendicularly: a semi-public space emerges from this connection along with a circulation path around the courtyard. Referencing this plan layout, ASASE House sits on a 16mx16m plot and consists of four rectangular units organized around a square shaped courtyard. Circulation spaces also revolve around this inner patio but semi-public spaces appear at the corners to establish a strong connection with the street. We propose a workshop/ common space for handcraft making and selling in addition to the individual rooms, which will be separated by bamboo partitions. The corner spaces and the room fronts are conceived as areas for social interaction between local people and residents. When proposing a new mud house prototype, we seek for a versatile solution that could be applicable in several contexts and adaptable to different functional requests rather than having a unique and closed house type or layout. Considering the purpose of the competition, a continuous-section based unit has been considered as the best solution: an adaptable model to current and future needs and to different budgets that provides an updated version of the rural mud house typology in Ghana. Throughout ASASE House, the same section unit stretches or shortens according to the user’s requirements. Thus, the construction technique is easy to learn and cheap to build by the local population. The total construction cost is $6,997.00. According to a research made by Earth Institute at Columbia University, Ghana’s forest resources are fast declining due to over utilization of the timber species. This proposal recognizes the potential of bamboo as a substitute for timber structure since the Ashanti region is believed to hold the third largest stock of naturally growing bamboo. Throughout the project, bamboo is used in various ways such as roof-structure elements, rooms partitions and weaving material for screens. Local artisans will be considered as a main workforce to reflect the Ashanti arts and culture, for instance through weaving labors. Optimizing sustainability solutions in the mud house prototype has been considered as one of the major inputs through the design process. The building’s section is designed in order to provide cross ventilation through openings on the upper walls and roof. Solar energy panels located on the roof can provide electricity and a rain-water collection system with a tank in the courtyard can supply clean water from the roof. The inner patio and one of the corner spaces can be used for gardening, providing vegetables and fruits to the residents. The design was intended from the constructive simplicity and bare materials point of view, trying to create a space where all activities could be fostered. We chose to use wattle and daub with a wood and bamboo structure with the idea of using materials low in embodied energy. For the roof we used “Structural Ceramics” - a technique developed by Eladio Dieste (1917 - 2000) – used in the construction of many houses and industries in the last 50 years. One of the main reasons for choosing this technique was budget and easy access to materials. Another characteristic of Structural Ceramics is that it has high mechanical resistance and the pieces that make up the system are very light (ceramic bricks, iron, sand and cement). Because of its elasticity, the system admits structural deformation, requires little maintenance and supports the difference of temperature, working very well as temperature and humidity insulation too. The use of Structural Ceramics for the structure is cheaper than the concrete and zinc roof. The technique is very easy to learn and does not require skilled labor, only an architect to supervise the job. We decided to give special importance to all activities and the way people will use the different spaces in the ART HOUSE. The project has some spaces for public and private use. We used zones differentiation by sequencing them, from the most private ones, like bedrooms, to the public ones. The space where social and artist interchange happen is the PATO. The services articulate the space and connect the use of the house. We designed the services taking into consideration the way they can be used independently of each other: the toilet, the shower and the lavatory are separate. The kitchen is a room of collective production, which serves to the PATO. The dwelling is a flexible space. We created a mobile panel system made with bamboo to allow the transformation of the space by changing the place of the panels. In this way, the artists can move them depending on the activity they want to do. The design of the project also included Constructed Wetland for water treatment. The Republic of Ghana is a country in West Africa and its capital is Accra. Abetenim Arts Village is a demonstration site and arts training center located 40 km Southeast of Kumasi in the Ashanti Region. The site for the project lies in Abetenim. Arts and Crafts are an integral part of the cultural fabric of Ghana. Different art forms that convey traditional wisdom and represent history visually are important and widespread in the country and are used extensively in fabrics, pottery, architectural features etc. Crafts like making sculptures, masks, pottery etc. are swiftly making their way in the Ghanaian market. Music and dance, too, are an important part of the cultural sphere. Art forms vary between different ethnic groups and regions thus bringing diversity in their forms. Retaining this artistic diversity in and around Ghana and being sensitive towards their growth is essential. Hence, we propose a combination of an art hub which attracts more and more artists from a myriad range of backgrounds, and a house, that is malleable to the needs of these artists. The house is designed keeping in mind the ‘living outside’ way of life of the people. The living spaces are designed to induce and reinforce interaction with exteriors as well as amongst people. An artist’s retreat demands various types of congregational and work areas so that he finds his corner and enjoys being there. Keeping this in mind, the work and leisure areas have been made as interactive and transparent as possible. This international art hub uses the locally available materials and techniques in order to achieve an economically sound solution. A major design intervention, of using materials available from the site itself along with techniques which are load bearing and span using compressive structures which do not require steel and concrete, has been proposed. Apart from the excavation for the foundation, the central sunken courtyard will also provide for earth needed to make rammed earth walls, sun dried adobe, tamped earth floors and the terracotta tubes for the outer enveloping vault. NEA ONNIM NO SUA A, OHU ("He who does not know can know from learning"). It means the continued quest for knowledge. It is the essence of wisdom. This aspect of learning can be seen as something that takes place on an ongoing basis from our daily interactions with others and with the world around us. Housing for the arts involves not just dwelling matters but also cultural changes and educational aspects. It is a reinterpretation of schools in terms of tradition and in the way communities hand down theirs culture. Life-long education is woven into the political, economic, spiritual and physical life. The apprenticeship system, and the wider community encouraged people to become gainfully employed, self-confident and constantly inculcating the basic values of tolerance, understanding, cooperation, justice and equality. In other words, it envisions the total development of everyone. In an art village the two processes, creation and learning by doing, are very close. By the connection of crafts and expertises together, the learning cycle starts. According to this, the art centre acquires sensory values and a special sharing spot within the village, as an open learning system. The design aims to integrate locals and guests artist, both interested in enhancing their skills. This full cultural immersion triggers a virtuous circle which improves the unrecognised local resources. The goal is to create an active network of artists and locals, offer a platform for the presentation art, and to develop a critical forum for the promotion of Ghana culture. The house is an organism where each room is function specific. The dwelling is related to the artistic experience, through different situations and sequences of spaces. The project is composed of 8 rooms connected around a small patio for social activities and cultural sharing. It provides a place to stay for 9 dwellers, single and double rooms (Painting room; Carpets room, Clay room, Wood room, Music room). The human body symbolism is implicit. The layout, in one hand, could refer to the brain structure as left-right hemisphere division, on the other hand it works as an entire organism: living room as the mind where experiences are shared, the kitchen for the stomach, arms and legs are the room where artists live. Modern housing can be still very innovative using traditional Ashanti Architecture, local arts and contemporary techniques. It provides a stable place for creative people from the Ashanti region and other countries to live, work, learn and create. The innovative design can be developed locally, according to material availability and construction system also involves local workers and artists throughout the building process. The design is scalable and easy adaptable to the context. The used typology is the traditional courtyard house with private outdoor area shaded and well ventilated thank to vents and open gables. The earth wall have high thermal inertia with less temperature variation per heating/cooling cycle. The roof height ensures a goor air circulation and the heat is well evacuated. For the roof, corrugated zinc sheets are effective, waterproof and lightweight. It overhangs 4 feet around the house to protect the wall from rain and sun. There are also gutters between roof to collect rainwater, and stock it in the courtyard. The outer walls have little openings and thermal insulation while fresh air is provided from wooden doors. 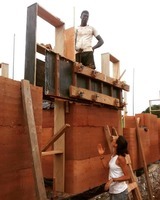 Cast earth method gives us the ability to self-build a wall with local resources and less waste of materials. Cast earth relies on the traditional process of shuttering and mold making. The mixing and pouring process uses ordinary soil. The foundations are mad of rock and a small concrete footing with steel reinforcing as required. The walls are built on a slab of concrete and they are capped with a bond beam. The compacted layers of earth are tighen by tension bar if need.The upper part of the walls are made of earth adobes and mud plaster outside. The clay plaster protects the wall and it allows traditional decorations. For the roof structure we use little wood, which is the main affordable material. The total budget is 6840$. The overall different techniques used can contribute to the local development. The house is based on the principles of design for climatic comfort with low costs construction, inducing the use of local materials (wood, cob, bamboo). The imported materials are used in minority. It is also designed as a model in order to sensitize the merits of the earth construction. The house was realized in series of units. The circulation spaces (bridges) are developed around a courtyard, the real place of the family daily life. The project includes 2 single rooms, 2 doubles rooms and a dormitory for 4 people. The patio has several qualities: it refreshes the building and gives an intimate space for creation activities. The simplicity of the conception and the minimum use of costly materials allow it to be easily adopted by villagers. Ceilings are made of dirt to improve thermal comfort and to give an acoustic protection against heavy summer rains. The construction is protected by a large metal corrugated roof to also cover external walls from water. This disunited on-roof allows natural ventilation bringing an essential and effective thermal comfort. To protect the building from monsoon, the first floor slabs are raised from the ground. The house on piles gives more intimacy and a better protection from external unpleasantness. The floors are made out of rammed down lateritic earth, a mixture of earth, water and cow dung. This technique, used in the north of Ghana, is very economic because of the use of materials in-situ. - Some units can be gradually added depending on the needs. Lastly, the local labour participation will be the key of the success of this project. It will enable them to acquire new competencies preserving at the same time tradition and innovative aspects of construction. Like different notes of a song linked together with spaces, silences and lines to compose a melody, the Harmony House is a composition of four elements placed around a courtyard for togetherness, creation and celebration. In this space, combining closed rooms and free courtyards, the artists interact with others and can create smaller groups for diverse artistic activities. We designed the togetherness courtyard upon the form of the recreated symbol of togetherness (from the African iconography) in which two paths cross in the center where a palm tree raises. At the end of these two paths, mud banks are located as well as in the rest of the courtyards, allowing people to seat and perform any work such as painting, modeling or playing an instrument, or just contemplate the landscape and rest. This courtyard also serves as a place to congregate the community in any communal artistic activity or celebration. The four units in Harmony House are for the following zones in the house: sleeping area, in two separate bedrooms for men and for women in a rectangular shape; sanitation, which includes 2 toilets shaped in a cylinder; cooking and eating, consisting in a kitchen with cylinder shape; and an extra multiuse oval room, for meetings and staying under a roof together. There is a covered gallery with bamboo structure connecting these four units all of which are facing to the courtyard. The selected construction method is rammed earth which is a well-known technique used by the local population. Roofing is made of corrugated zinc sheets due to its characteristics to stand the heavy rainfall and long lasting conditions. In the tropics, shadow and ventilation are a design premise, which is the reason for having a floating roof over the volumes bringing shadow to the surfaces and to the areas around them. This also creates a puffer zone for ventilation allowing hot air to ascend and escape through the transparent bamboo placed in the upper section of the walls. The distances between the elements allows the air to flow between them and from the exterior into the courtyards. These distances also enables the community having views from the exterior into the courtyards and vice versa giving a visual contact that helps them know about what the artists do and avoid the sense of secretism or isolation from the community. Due to the high rain regime in the Ashanti region, we considered saving rainwater and have it as supply for the Harmony House. A farming field designed to provide fresh vegetables is located in the north area of the plot of land. The estimated manufacturing cost results in US$ 6,940.00 for the 4 units (US$ 5,150.00 in materials and US$ 1,790.00 in labor). The Harmony House was conceived to shelter all kinds of artistic expressions such as painting, singing, acting, modeling with clay or mud, dancing and so on; it can also be used as a common house for the local families in Abetenim. The « NKYIMU» project proposes to highlight the artistic practice focused on textile and fabrics in the heart of the Abetenim Art Village, in the Ashanti region. This little known art form gathers a wide range of creative arts, such as sculptors, contemporary visual artists, textile and fashion designers, but it can also be the opportunity to mix international contemporary art with Ghanaian craft skills. Indeed, the Ashanti culture attaches great importance to fabrics called Kente and Adinkra which are deep-rooted in Ghana heritage and traditions. Art of weaving or printing textile is most often associated with genuineness, precision skill and cultural sophistication, it's a complex language in itself which marks a social and cultural identity. By its architectural, environmental and social posture, our project aspires to be the place where connections between different cultures can take place and weave artistic and craft skills together. Most of the time, the traditional Ashanti house is organized around a courtyard which provides a wide range of uses in the heart of the house. We deeply believe that small outdoor spaces offer the opportunity of appropriation and meeting each other. Therefore, how can we imagine a place to re-invent a local community’s way of life for international artists? As a hybrid space, the central courtyard catalyzes the social and artistic interactions. Everybody can cross and meet artists creating there. It’s also a large outside exhibition space that it’s pleasant to stroll through. Moreover, the project aims to facilitate exchanges between Abetenim inhabitants and artists in residence, by creating open and shared workshops. We consider these spaces as “tools” for textile art to be a collective creation, a social link and a purpose to live together. Nevertheless, creative process and life also calls for reflective and meditative times, private moments leading to others spaces like rooms with patios, with a view on the sky in an intimate outside place. - RAMMED EARTH comes from clayey’s village ground, and is the main material to build the big outer wall which anchors the project on the site and give the opportunity to dig and carve niches inside, but above all, it’s the best way to provide freshness during hot reason, because of its large thermal inertia. - MOBILE TEXTILE SYSTEMS made out of wood, kente fabric, and mosquito nets, are the last layers composing dynamic and reversible facades, filtering natural light and leaving the inner spaces open for cooling ventilation, optimized by the courtyard and overall bricks placed, on its upper portion, in the earth outer wall. At night, perceptions reverse. Walls disappear and the membranes become visible limits, revealing the balance and contrast between the heavy earth walls and the lightweight textile fibers. The idea of the bamboo hut has been developed since I first approached the sustainable architectures during my studies. I have always found really expressive all these lightweight architectures, typical of the Southern Countries and made by the most common elements we can find within these lands. During the last decades the design profession has afforded lots of difficulties, due to the globalized market which has brought new ways of construction developments. The most common effect which has spread out all over the Countries, no matter they are situated in the Western or the Eastern regions, has been the gradual lost of many cultural identities, intended as cultural, ideological and also technical aspects. During my research upon the African culture I afforded many texts about new urban settlements, developed by Real Estate companies which are part of this global market. Therefore with this project I am trying not only to develop a sustainable construction, but also continuing my personal research and thoughts “out of the box”, exploring new possible ways of learning and continuing with many difficulties this magnificent profession. I am still wondering why the traditional West African earth architectures are so far undervalued. If the architecture is properly a cultural expression, maybe is properly the culture which those buildings come from to be so far from the European mentality, which relegate them out of the Academies. difficult to be read by a writer or a simple traveller. All the pictures proposed in this research record the extraordinary creativity which the local builders have while they work upon their “huts”, bringing all the possible efforts to make them durable and resistant. They use many geometrical motives, textures, shadows due to different profiles and sometimes they leave exposed the structural signs. All these elements gave me the inspiration for this project, in which I tried to develop a sustainable, affordable and flexible hut, around the hestimative cost of 4.400 $ (as you can resume from the schedule in the third board). I wanted to design a proposal which I really could afford within the next months, so I thought a simple, light structure made by bamboo frames, which can develop from a central room and a service space and gradually grows with the addition of different bedrooms (one or two at the ground level, and two at the upper one). The main walls have been thought by cob (earth, straw and water mixture) for economical reasons, while the main corners are proposed as earth+cement blocks. Naturally, If we manage to reach a good fundraise campaign, we can also think to realize poured earth+concrete walls, which are more resistant to the humid climate of the central Africa, increasing the durability. To use the words of the philosopher Paul Virilio, “it’s difficult to predict the future for these architectures, as the fragility of the earth as a material and the undoubtedly passion of the Africans for the concrete constructions. If they could have the means, many of them would tear down their houses to rebuild them with concrete blocks and metal sheets”. Our goal is therefore to help these people to improve their way of living, learning everyone from the others, because as Bernard Rudofsky says “above all there is the humanity of this architecture”. House for the Arts built from earth should not scream, should be a background for the activities for the artists, where they can relax, exchange ideas with others, or even create with the inflow of inspiration. Our object was shaped in its basic by nature, primarily by winds blowing in the direction of the north-eastern and south-western, which knocked the typical mass of the house of the Ashanti region. In this way, a semi-private courtyard was born, which allows artists to inspire from the environment, being still inside, and on the other side, inhabitant gives a chance for watch artist's work. We decided to add character to our shape and use 'Kente' patterns, which has been interpreted by us, as an openwork details that simultaneously allowed better ventilation for the bedroom. To perform such openings best choice was a mud brick , which could be done by volunteers at the construction site, what would definitely lowered the costs of the building. Adobe bricks should be made of the local earth, using a variety of shades of natural raw material. Through proper positioning creates a mosaic effect to evolving patterns of Kente. In order not to overheat the room by warming-up metal sheet, we also decided to separate the space under the corrugated zinc of the room using plywood, so we would get two layers of ventilation - double ventilated roof . Roof is constructed by the classic wooden structure, giving it the right angle. To prevent the negative effects of the rains, tracts have been extended so that you could easily reach any place of the building. At the end we added a narrow window with extruded wooden frames that creates a modern look to the entire design. Moreover it gives a lot of light for the interior but not a direct sunbeams. To conclude, our design has a simplicity of form combined with the subtle wall detail that stimulate artists especially during each sunrise and sunset. The built environment is to provide a place of stay for 8 to 10 international participants who come to immerse in the local culture to create works or collaborate on a community project in the context of rural Abetenim. The tropical warm humid climate of Ghana and the local building materials are the guiding sources of what are the possible architectural solutions that can be realized in the presented situation. This idea proposes a modular design to generate a prototype. A basic module has been designed which can be added up to form the different type of required spaces. The dimensional parameters of the module is derived from the construction techniques and building materials, their potentials and limitations while the functional parameters have been derived from the type of activities it will cater while the spatial parameters develop from contextual and environmental considerations. Flexibility, to house the participants coming from different parts of the world, who work in multifarious genre of art. The design calls for a generic system which provides flexibility to accommodate different user preferences. As the set of function changes, the space can be adjusted according to the changing necessities. Available Resources, which are of a limited range apparently, but the potentials of other materials which can be locally harvested have also been explored here. As this design is part of a collective process, it can have an impact on the local community on a greater effect, addressing the issue of overcoming the local stigma that mud architecture is architecture for the poor. The building is placed at the southern side of the site, after crossing a field, the central outdoor area for the residents. This green court is under shade continuously, ensuring a comfortable environment all day long. The south-west wind is refreshed by the bamboo tree layer on the western edge of the site. The roof is pitched reversely, to allow a central channel to collect rainwater. This direction o f the roof opens up the indoor towards the outdoor, allowing more air and sunlight inside besides a stronger indoor and outdoor connection. The service blocks are located on the east and west end, strengthening the north-south orientation of the building. The north and south sides are completely open, allowing maximum air circulation, a must for thermal comfort in warm-humid climates. The activity and living spaces are aligned along the courtyard. The activity areas are adjacent to the courtyard, as they might be used for multifarious reasons along with higher number of people. The private, living areas are at the southern end, which also makes the living quarters more comfortable. FOUNDATION & PLINTH	Tamped Earth	Loose earth is tamped and compacted to form a strong base. Cement Concrete	A 25 mm layer to be casted on top of the wire mesh with a neat finish layer on top. FLOOR	Bamboo	Covers the span of the adjacent mud walls, thus simulataneously acting as a horizontal tie and the upper floor. Bamboo Mat	Placed on top of the straw layer. WALL	Earth	Cob walls that form the basic structure of the house. The dimensions of the walls and spacing between adjacent walls is derived from the structural capacities of cob floors. Coconut Fiber	To be used as a binder with earth. Cement Concrete	To make the lintels on top of doors. STRUCTURE	Bamboo	Form the beams which connect the cob floors, working as a horizontal tie instead of the typical use of bond beam, reducing the cost of material and construction. Bamboo mat	A secondary layer beneath the Zinc sheet, which acts as a thermal buffer. WINDOW	Bamboo	Vertically folding windows, each panel consisting of bamboos aligned side by side. “Learning Centre for creative people from the region and other countries to live, work, learn and create”. The main vertical walls, where the two entrances have sufficient openness to allow visitors to see in, are made of 24 inch adobe blocks with a mixture of lime, especially in the external and internal plaster work. The ‘compound’ is surrounded by eight sleeping quarters feeding into a bamboo forest of trusses that has a corrugated zinc roof covering. The roof collects rain water from a central gutter that feeds rain water into two 500 gallon drums at either end of the building, situated directly above the toilets and the kitchen. This rain water harvesting system allows for the ‘wet’ trades to utilize, each being placed at the extremities to allow ease of wet services being discharged without interfering with the main earth walls (greatest area of failure with earth construction where damaged water pipes seep into the walls). The roof is made entirely with inverted roof trusses made from Bamboo; a material that has enormous properties but is under-utilized in building. Each joint is connected with timber dowels and bound together with locally made rope. Bamboo is more economical element than timber allowing the budget to be adhered too. The making of these trusses is a skill that can be easily imparted to the local carpenters. (We have implemented such skill training with those who had never used bamboo before). The bedrooms are extended outside the ‘covered compound’ using 10 inch adobe sun dried blocks, in a vaulted structural format. Proportions are: 60% sand, 30% clay, 10% lime. The water proofing chemicals will be combined with the 3 inch external lime mix plastering making the structure completely water tight (we have extensive experience in this). The external vertical adobe wall is painted according to traditional Ghanaian patterns and colors, whereas the ‘compound’ wall is faced with wall sculptors that the artists working here will execute themselves. The floor is 4 inches of leveled concrete laid on a sand and gravel/stone bed. Windows and doors are being kept to a minimum and used where security is paramount. The bedrooms are separated from the ‘compound’ by heavy duty curtain material, providing sufficient privacy but also allowing psychological and social interaction to take place when curtains are drawn open. Climatically the entire building has openings at roof and ground level for ventilation to take place all times of the year. Weaving is an art form that is important to a broad range of cultures. In Ghana, Kente Cloth is important culturally. The patterns in these weavings are symbolic to their beliefs. Around the world, weaving can be traced through various histories, including Native American and Japanese for both decorative and functional purposes. Weaving still remains current to contemporary artists. There are two main components of a finished weaving. The warp is the foundation for the weaving. The weft brings life to the work. It is the visible part and also the character of the piece. Our art center is structured around the idea of a weaving. The site for The Weft Wall is on the edge of the Ashanti Arts District, reaching North-West, towards the nearby weaving villages, creating an implied connection and openness between the two. The main spine of the project is a weft wall. It weaves in and out of the structure of the roof and defines the programmatic elements of the art center. The roof is lightly structured, resting above the weft wall, creating the structural rhythm for the expressive wall. This structural element can be compared to the warp component of the weaving. On the South-West side of the wall are the art components of the program. We are defining the space to be used by weavers, though it would work for other types of artists as well. The entirety of this space is lowered, in order to distinguish it and also to make it more expansive for various community events. This programmatic component is also facing windward, in order to keep these more frequently used spaces more comfortable. The most western space is to be used for the preparing and spinning of roving because of the enclosed nature of the space. The next space over is for dying of fibers. This space has a water basin with access to the stored water, and is closer in vicinity to the open sun and an area for growing plants used in the dying process. The center space is for access to the private areas and also an exhibition space. There are different hooks within the rammed earth wall for the hanging of weavings. The last and largest area is for weaving. Looms of different sizes can fit comfortably while artist sit together and weave. On the North-East side of the wall are the private areas. The bedrooms have storage niches within the rammed earth and also screened openings into the lowered art spaces. The restrooms and shower area are closed off, with an entry through a small common area. On the more Southern end of the Weft wall is a linear outdoor kitchen with enough room for cooking for many. Adjacent to the kitchen is a large storage area for various supplies, including a water tank. The Weft Wall is meant to be a space for community involvement. All of the art spaces are mostly opened, but covered to protect from rain. The step down provides ample seating for large community events and gatherings. Along the columns is the weaving wall, which can be woven with different palms, leaves, and other various items to close off the interior spaces, or to be used as extra space for exhibitions. Because of the linear nature of the wall and the space in general, additional components of program can be added on, as need be. Local conditions have been taken into consideration wherever possible and recycled materials can be woven into the palette, for example, the formwork for the weft wall being used for bedroom walls. The project can be built within budget (as noted in attached document), and locally sourced. All Workshops to realize design entries in the 3rd Earth Architecture Competition are listed on this page. Please, browse through to find the one of interest to you. To participate, contacts the workshop leaders for application. WHAT: Join us for a workshop to build the 1st prize winning design in Nka Foundation's 3rd Earth Architecture Competition by the design team of Sheikh Ahsan Ullah Mojumder, Chowdhury Mohammad Junayed and Erum Ahmed of Sheikh Ahsan Ullah Mojumder & Associates in Bangladesh. WHO CAN PARTICIPATE: This an open call for participation. The workshop will bring together enthusiastic volunteers from around the world including students and recent graduates of architecture, landscape architecture, engineering, interior design, the arts and anyone interested in construction can join the workshop and play a part in line with their expertise. WHERE: The workshop will be held at Abetenim Arts Village located approximately 50 km Southeast of Kumasi, the capital of the Ashanti Region in Ghana. The workshop is a collaboration between Nka Foundation and Building In Basics. BUILDING IN BASICS is a research and design initiative based in Dhaka, Bangladesh that focuses on socio-cultural and environmental responses to traditional building and material techniques and their contemporary adaptation. Be part of this hands-on experience to built eARTh house, the 2nd prize winning design in Nka Foundation's 3rd Earth Architecture Competition by Lorenzo Conti, who is an architect in Italy. The main goal of this workshop is to bring together local builders, regional craftspeople and enthusiastic volunteers. The challenge is to share the knowledge and expertise of everyone involved to create a built environment in order to embed the earth construction in Ghana's long tradition of sustainable housing. The building is to be designed for use by either musicians, theatre artists, potters, sculptors, painters, textile artists, designers, writers, or media arts practitioners. The workshop will be held in Abetenim Arts Village, located 40km Southeast of Kumasi, in the Ashanti Region of Ghana. On top of providing a community in need with new housing solutions, volunteers will learn how to build a earth house using a site-specific approach, traditional practices and encountering local materials, construction and community. For volunteers, the workshop will be a platform for continued education in the pragmatics of designing and building. You will immerse in the rich Ashanti’s culture to explore and learn by collaborating on the building project. You will have short breaks from the construction project to visit local attractions and participate in field trips. You can join us at any time from 4 to 12 weeks to help build our unit. Anybody interested in building with earth is welcome to join. Architecture students, architects, sustainable practitioners and volunteers from around the worlds. We need students of landscape architecture to landscape the completed unit to blend with the rural landscape, interior design to organize the interior spaces, product design to create the furniture and fittings, photography/video arts for a documentary and a sculptor/a painter to create works of art to adorn the interior/exterior spaces. African studies are also welcome to do their part in the building project. You will get the credit for the the role you will play in the project. Students can use the opportunity for internship, personal research or thesis. Designing Leaders: Lorenzo Conti (Project Leader), Arch. Mattia Lucchetti, Arch. Sara Bettoli. Team based in Italy. Join us as a workshop participant to realize the 3rd prize winning entry in 3rd Earth Architecture Competition in Ghana by the design team of Eddie Winn and Samantha McPadden in Los Angeles, USA. Our workshop is based on site in the Village of Abetenim, Ashanti Region of Ghana. It is located approximately 50 km east of Kumasi, the capital of the Ashanti Region in Ghana. Everybody is welcome: Graduates and students of architecture, engineering, interior design, landscape architecture and sustainable practitioners from around the world. Students can use the opportunity for internship or thesis. Come to explore and learn-by-collaborating on the building project! EVERYBODY CAN PARTICIPATE: Architecture students, architects, sustainable practitioners and volunteers from around the world. Students can use the opportunity for internship, personal research or thesis. ARTHOUSE is a 220m² (2400sq feet) one story artist´s residence, designed to accommodate from 8 to 10 artists. The project presents technical novelties, the use of mixed techniques as wattle and daub walls combined with a structural ceramic roof (developed by Uruguayan engineer Eladio Dieste). It also proposes the use of alternative sewage system, ensuring a proper wastewater disposal. ARTHOUSE is conceived as a way of constructing which adapts to the available local resources, minimizing high em- bodied energy materials. This way we can create high quality architectural and environmental friendly projects, capable of being replicated in the west-African region. This summer, we are going to Ghana to help build a unit of a vocational skills center for youths of Sang township. Join us as a workshop participant in a case study house about rammed earth construction and communal dwelling typologies. Together, we will be temporarily Ghanaians by immersing in local culture and lifestyle to gain an in-depth understanding of the local issues and practical experience. You’ll have the opportunity to explore local earth architecture traditions through site analysis, field trips and the construction process. Volunteers can join at any time and participate for a minimum of two weeks. A student can use the opportunity for an internship, thesis or personal research to rediscover the rudiments of architecture and nuances to enrich your design thinking.